FORT RUCKER, Ala. (March 27, 2019) - Ask any motorcyclist and they'll tell you riding in the rain is not fun, especially if you're not prepared for the reduced visibility and slick surfaces. Unfortunately, most riders never give much thought about how to handle losing control until it happens - and then they panic. However, if bad weather puts you on the road in slippery conditions, with proper preparation and forethought you can safely make it to your destination. The key is maintaining traction and keeping the rubber side down against the road at all costs. First, visibility is a big problem for riders when it is raining. Since motorcycles don't have windshield wipers, treating your windscreen and face shield with a product that will improve rain runoff can make a huge difference. Also, it is to your advantage to know which areas of the road are the most slippery. Roadway markings, slippery even in clear weather, become even more so when ice or rain coats them. This is particularly a problem at intersections, where you may encounter crosswalk markings. If you have to turn across these white lines, go slowly, avoid braking and ride in the most upright position possible. If you have to stop, do so either before or after reaching those roadway markings. When you pull off, don't accelerate until after you have crossed the markings. If you encounter a sudden downpour, it's a good idea to stop for a break and allow the oil on the roadway to wash away. Typically, it takes about a half hour of steady rain to remove the accumulation of oil drippings. When you get back onto the road, avoid riding in the center of the lane because that is most slippery area. Instead, ride in the traffic wheel ruts to take advantage of cars pushing the water off the road in front of you. Even when roadways are dry, traffic lines, grates, railroad tracks and tar snakes all present slipping hazards. By being observant, you can often predict changes in traction by the color of the road surface. Darker spots caused by oil or fuel mean slippery areas that can lead to an accident. Loose material on the road can also present a slipping hazard regardless the weather, although they're normally made worse by rain. Sand, dirt and mud that have become mixed with gravel may look the same color as the pavement - especially over time as it has been sitting on the road. Because of that, it's important to take extra care in turns where sand or gravel may have washed onto the roadway. You also need to pay extra attention around construction areas where vehicles turning onto the pavement from dirt roads may have scattered dirt or sand. Proper traction control is the answer to preventing slipping and sliding. Traction, simply defined, is the very limited amount of rolling grip between your tires and the road surface and is significantly reduced during slippery conditions. 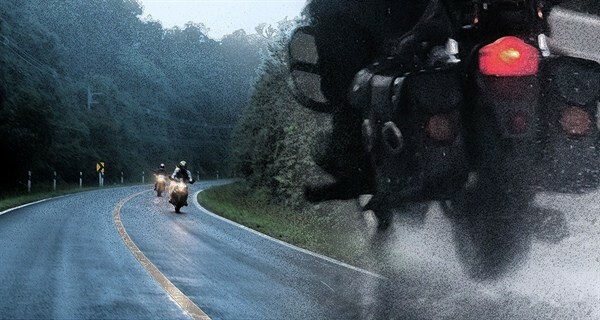 Safe motorcyclists must constantly manage their traction on both wet and dry roads. To do that, there are some questions you need to answer as you ride. The most important ones are how much traction do you have available, what is consuming your bike's traction and how much traction do you have in reserve? How much traction you have available is related to how much tire surface area you have on a motorcycle. Would you be surprised to learn the entire contact patch of both your tires is about the size of the palm of one hand? That makes understanding what consumes traction and how much you have in reserve very important to safety. Some aspects of traction management are within the rider's control. Things such as the condition of the tires and brakes indicate how well we maintain our motorcycles. Other things, such as whether we lean excessively during turns, indicate our riding attitude. Both of these must be balanced against the things we can't control, such as the weather and road surface conditions. When you're not sure how much traction you have available, slow down. The final question is how much traction do you have in reserve? Unfortunately, there is no way to know that for sure. What you can be sure of is that anything you see on the road that consumes additional traction is a warning sign to exercise extra care. You can do that by reducing your speed, placing your weight on your foot pegs, picking the best surface and following smoothly through your turns. It's also important to keep a steady hand on the throttle and keep the bike in as upright a position as possible until conditions improve. The public road can be an unpredictable place. It's possible to overlook the hazards on the familiar roads where you live and end up in trouble. By maintaining plenty of reserve traction, regardless the roadway conditions or weather, you can ensure your ride ends uneventfully, not with a preliminary loss report. 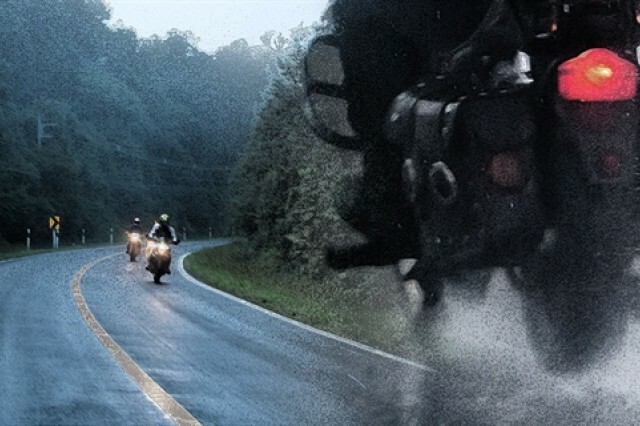 Ask any motorcyclist and they'll tell you riding in the rain is not fun, especially if you're not prepared for the reduced visibility and slick surfaces. Unfortunately, most riders never give much thought about how to handle losing control until it happens - and then they panic. However, if bad weather puts you on the road in slippery conditions, with proper preparation and forethought you can safely make it to your destination. The key is maintaining traction and keeping the rubber side down against the road at all costs.